The term has somewhat differing meanings in the United States and the European Union. In the US, the term refers to a fair distribution of environmental burdens, and benefits, without a disproportionate, negative impact on communities of color or low income. The concept developed in the 1980s and grew out of the civil rights and social justice movement of the 1960s, especially in the African American community. A common focus is the frequent location of polluting waste disposal and industrial sites in communities of color and low income. As in the US, the term is sometimes used in the EU to describe efforts to protect poor or ethnic marginalized people from environmental harms, but it generally refers to the principle that all people are entitled to a clean and healthy environment, as a matter of justice. So its focus is on a wider population, and includes global issues and intergenerational conflicts. 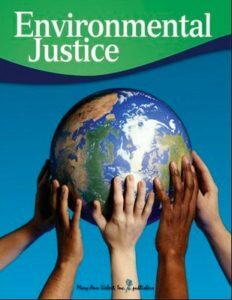 At one level, in the EU the consideration of environmental justice derives from or at least is consistent with the EU principles of the polluter pays, the precautionary principle and the Arhus Convention, with its focus on access to justice in environmental matters. In the EU there is more of a broader, philosophical understanding of the term whereas in the US it is more narrow, pragmatic, a difference that often characterises a difference between EU and US thinking. 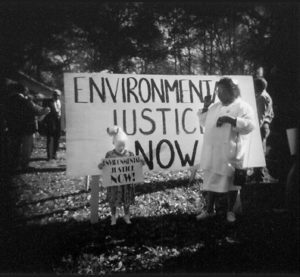 Some in the US environmental justice movement have resisted expanding the concept beyond its original disparate adverse impact meaning out of concerns that communities of color and low income would be ignored if the movement was expanded to focus on others. If there is a community of color or low income near you, identify any environmental risk to that community that is not also a risk for other communities in the area. And determine what can be done to alleviate that risk. How would you apply environmental justice to the destruction of natural habitats? Identify the ways in which global warming is an environmental justice issue?